We are proud to announce that the first preview version of the GUI wallet is ready for public testing. This is a development preview release, with intention of providing a demonstration of the early stage software to users to give them a chance to experiment as well as provide input and feedback during its initial development. This is not yet a stable release, so please use at your own risk; It is advised not to be used for managing any critical accounts or funds. The custom wallet features gorgeous graphics, animations, and professional audio. As you would expect from a GUI wallet, current features include managing accounts, sending and viewing transactions, and more. Stylish audio alerts also aid users by letting them know what the wallet is doing. This provides an enjoyable personal touch, making Expanse unique in the world of silent wallets. The GUI also features an Integrated Console, allowing for access to the command line tools for advanced users in addition to it’s elegant intuitive interface — Making it easy and ideal for anyone to use and get started with. The Expanse wallet is for everyone: simple, unique, and beautiful. Additionally, co-inciding with the Development Preview Release, Expanse has updated the codebase to the latest ethereum protocol. Making Expanse fully up to date, and offering an exceptional visual experience with the GUI wallet that is simple for all to use. 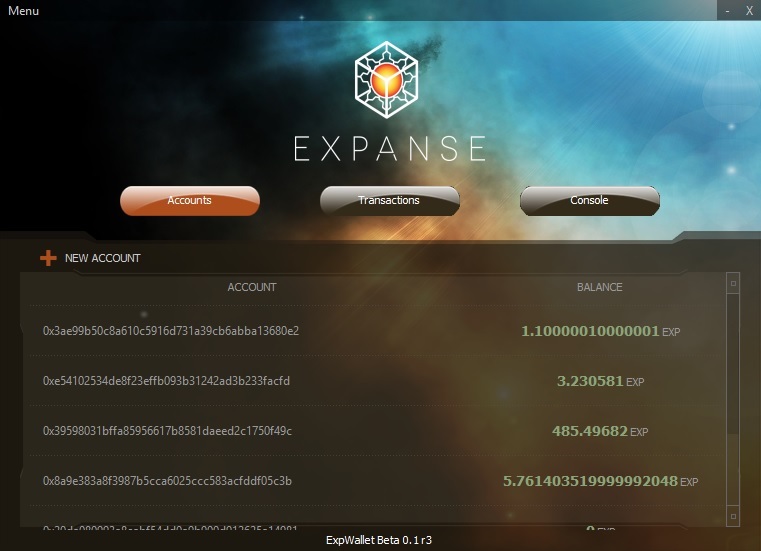 This is only the start, both for the GUI Wallet, and the Expanse Project! The DAO white paper will be released soon, detailing the design and implementation of the organization. Soon to follow will be the live Launch of the DAO, including an integrated management panel directly in the wallet allowing users to participate in managing and creating/voting on issues in an intuitive user friendly way, straight from the GUI. **If the expwallet application opens, the Console tab can be useful for diagnosing issues. Error messages and debugging information should be displayed there when there is connection issues and console output displayed normally. If the application does not open, please state the error displayed. If this is your first time running expanse, you must agree to the user agreement: You can do this via the console tab, in which the agreement will be displayed if it is your first run/you have not yet accepted it. Enter "Y" in the console to agree if you accept the terms. This must be done before expanse will function on your system. expwallet is bundled with a copy of gexp. On the windows version, it is included in the zip and is required to be in the same directory as expwallet. On the macintosh version, gexp is bundled inside the application bundle. If you are already running an instance of gexp on the system, expwallet will detect it and attach to it. Note: a copy of gexp must still be placed in the same directory as expwallet, even if attaching to an instance is running from another location. File Menu & Mac Application Menu’s for wallet do not properly function. Will be resolved in the next release, please close the application via the ‘X” icon in the right hand corner. I'm glad you like it. Whats your favorite thing about it? Its moore simple than the console. YUP! Which is insanely important. What a great coin! We've already mined a few blocks on our own pool but are not able to figure out how to get the wallet working on Mac. First time it said (in console): "No such file or directory". Then it was okay this afternoon. And now I am back at the first issue. I don't see any imported accounts, console says "No such file or directory"...what to do? Hi. Do you have a mirror for this? I'm receiving a 404. That's good news. GUI WALLET is great.